‘When we first got VvS1 we wanted to cruise the most beautiful places on earth. 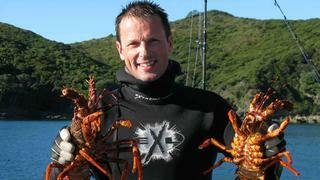 We couldn’t wait to get to islands like Taihiti and Fiji,’ says New Zealand jeweller Michael Hill. But despite clocking up thousands of nautical miles on expeditions to what are widely considered to be the most exotic and exquisite islands in the South Pacific, he has come to the conclusion that nothing beats New Zealand. Michael Hill is not the sort of person who can sit still. ‘We like doing things,’ he emphasises, reeling off kayaking, swimming, snorkelling, diving and fishing, and his expedition motor yacht VvS1 was conceived and built for just such a lifestyle of adventure and watersports. 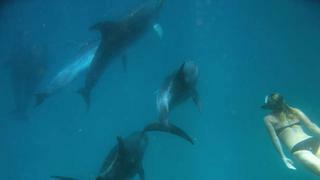 Being a passionate fisherman a favourite cruising trip is around the North Island coastline above Auckland, where, unlike overfished Tahiti, the wild remoteness means waters teeming with fish, shellfish and big game fish like marlin. 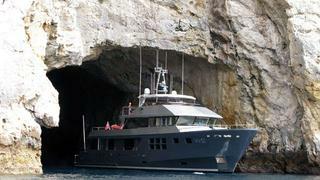 VvS1’s relatively compact and self-contained 34 metres is, according to Michael, the ‘perfect size’ to tuck into bays and anchor in small intimate coves along the coast. 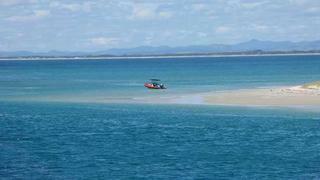 Then it is only a short passage ashore to a ‘new’ world of pristine beaches and virgin hinterland. It is a cruise ideally undertaken over a leisurely two weeks, allowing plenty of time for catching or chasing fish, as well as diving, kayaking, exploring beaches and caves, hiking inland into primeval forests or just chilling out in protected anchorages, absorbing the isolation and beauty. 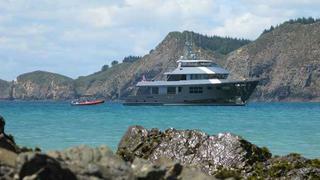 From Auckland, the yacht heads for the Mercury Islands, a chain of seven volcanic islands which lie off the northeast coast in Opito Bay. Only Great Mercury Island, owned by New Zealand financier Michael Fay, is inhabited – the rest form part of a nature reserve for many endangered bird and reptile species. 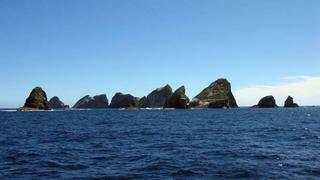 But it is from the water that the island’s extraordinary rock formations can be most appreciated – jagged limestone cliffs that plunge down into clear waters teeming with a profusion of fish, from red snapper to the lively native kahawai, and even dolphins, which sometimes follow the yacht and are amenable to being joined for a swim. 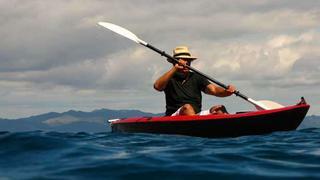 Coastal caves and pristine white beaches can be reached by tender or kayak. Beyond the Mercury Islands lies Great Barrier Island – a great place for fishing, diving and hiking while the yacht is tucked into a protected anchorage. But to reach real isolation it is two hours’ sail north to the rugged Mokohinau Islands, which, poised at the edge of the continental shelf, are home to unique wildlife and plant species found nowhere else in New Zealand or the world. He recalls taking a small tender to a rock ‘in the middle of nowhere’ and fishing for a mere half an hour alongside the yacht’s engineer. They reeled in three 70-pounder hapukas (groupers) and could barely make it back to the yacht so weighed down were they with their prodigious catch. 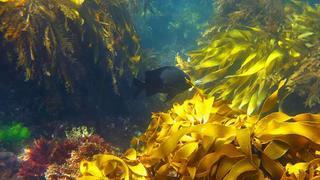 It is also a great spot for kingfish and crayfish (rock lobster). The yacht then heads for Whangarei, the place where Michael Hill was born and started out in his uncle’s jewellery business before establishing his own in 1979. ‘I have always loved the sea,’ says Michael, describing how in his youth he would go out in a clinker boat to catch snapper. From that rowing dinghy the boats just got bigger and better, culminating in VvS1, with its live bait tanks, ice boxes and teppanyaki grill awaiting the return of the 6.7 metre Rayglass tender with its hoard of fresh fish. The catch of their game-fishing exploits – among them blue marlin, black marlin, kingfish and sailfish – are all put back. ‘We only kill to eat,’ he concedes, but as an avid cook who often entertains informally in the kitchen as he prepares food for family and friends – VvS1’s open galley is positioned aft for just such social occasions – this is one of the ultimate pleasures of fishing. There are more seafood delights lurking in Whangarei Harbour with its dramatic heads that tower above the shoreline, intricately indented with beaches and bays. A shell bank covered in ‘pipi’ – 10-centimetre-long clams that are delicious when steamed – yields a bucketful in minutes. A little further up the east coast Tutukaka is a good launching point for game fishing on the open sea and is also the gateway to the Poor Knights Islands – reputedly named for their resemblance to a bread-based pudding popular with its European discoverers. The islands’ transformation into a marine reserve several years ago was controversial amongst fishermen, who have been banned from fishing within one nautical mile of the islands, but it has brought fish life back to what it was in Maori times and made it one of the world’s top dive sights – rated in the top 10 by none other than Jacques Cousteau. Michael Hill describes it as ‘the most sublime place, surrounded by clear water that goes to inky black.’ Divers and snorkellers will find an astounding marine topography of underwater caves, arches and outcrops festooned with anemones, hydroids and coral, sponge gardens and vivid gorgonian fields, populated with schools of subtropical fish – dancing demoiselles, grouper and perch. Above the surface, cliffs rise steeply from the sea, with arches, tunnels and coastal caves to entice explorers, canoeists and even musicians – Michael once played a Bach solo on his violin in one of the caves. Four hours’ sail from Poor Knights is the Bay of Islands, legendary amongst sportsfishermen, and the place to touch base with a bit of civilisation – there are villages to visit and restaurants to try, but it also abounds in beaches, hiking trails and diving sites. En route to Whangaroa, off the coast of Matauri Bay, the Cavalli Islands are worth a stop for their enchanting beaches and coastline, and a dive in the wreck of Rainbow Warrior, the Greenpeace vessel scuttled there in 1987 to become a complex ecosystem of corals and sea anemones. Only an hour away, Whangaroa is another sportsfishing mecca with its own characteristic beauty. Towering buffs and piles of volcanic rock protrude through steep forested shores fringed with beaches and bays with deep anchorages. By contrast, Spirits Bay, one of two bays spanning New Zealand’s northern tip, has a more hilly, undulating landscape carpeted with wild grasses that grow right up to the edge of a seemingly endless beach of pure white sand. Named for the Maori belief that this is where the spirits of the dead depart for the afterlife, it has a quiet serenity that is hardly disturbed by human intrusion. ‘It is unique for having so few people and being so unspoilt,’ says Michael. But for the best and most prolific fishing New Zealand has to offer, the cruise heads 35 nautical miles northwest of the North Island’s northernmost tip, where the powerful currents of the South Pacific and Tasman Sea collide, and the barren but beautiful Three Kings Islands jut out of waters heaving with marlin – black, blue and striped. Game fishermen also reel in yellowtail kingfish, king terakihi, broadbill swordfish, spear fish and even mako sharks from a deep submarine trough separating the islands from the mainland. 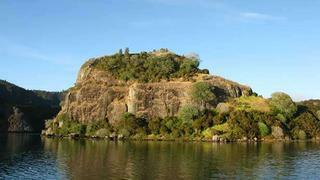 This is the northernmost point on the itinerary and for a fishing cruise, a high note to end on.